FURNISHED WEEKLY RENTAL Charming beach cottage located 3 short blocks to the beach. Within walking / biking distance ofrestaurants, shopping and local breweries, tennis courts and parks. Walk or bike to the beach. Relax on the open deck overlooking the private fenced back yard with dining table, bbq grill and lush landscaping. 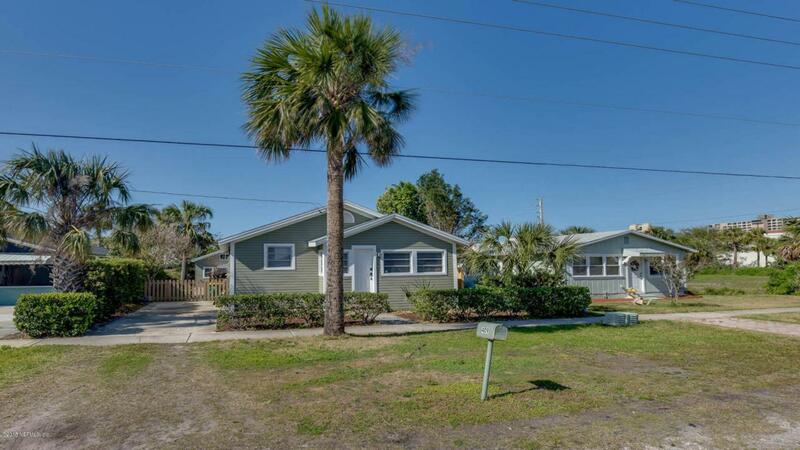 This rental has everything you need to enjoy your beach getaway. Fully stocked kitchen, full size washer & dryer,bikes with locks, wagon and beach cooler to carry supplies to the beach. Spacious living room with lots of windows for natural lighting, wood ceilings with natural finish,laminate wood flooring, ceiling fan,50'' LCD TV, tvstreaming device & comfy sectional sofa. Kitchen with side by side fridge, electric stove, stand alone microwave, dishwasherand plenty of small kitchen appliances. Master bedroom with tempur-pedic cool gel mattress, laminate wood flooring, ceiling fan, tv, and large walk-in California style closet with plenty of storage. Guest bedroom with queen tempur-pedic cool gel mattress, laminate wood floors, ceiling fan and standard closet. Twin & Queen air mattresses. Spacious bathroom with tub / shower combo, vanity and large linen closet. Bright dining room / sunroom with lots of windows overlooking back yard seats 6. Pak N Play and car seat for up to one year available for rent at $15 each weekly. Dogs welcome with owner approval and pet fee / deposit. Comcast basic cable with HBO, Comcast Blast High Speed Internet & monitored alarm system. Back part of exterior workshop not available. Rates subject to change for holidays and special events. Perfect beach location.... Rates do not include taxes, cleaning, reservation fees or damage protection.